I have background in Indian classical music and know that it is not the kind of music to get small children excited. On the other hand, I have also seen folk tunes have a deep impact on small children as well as adults. When I came across TMC music, I instantly knew that this is the kind of music both children and adults will enjoy. According to you, when should music be introduced to babies? We all know that of the five senses in human beings, hearing is the first to develop. It develops in the womb itself and a baby knows parents’ voices even before birth. After birth, communication skills develop greatly by listening and not talking, and what better medium to listen and remember than music? I feel babies should be introduced to music in the womb itself but make sure it has to be the right kind of music. This program is for kids between 6 months to 5 years. How do you ensure that with such a vast age gap, each kid is stimulated enough and has some take-away from the class? Five years seems like a lot, especially in the early years, where babies have so many milestones to cross. But in our classes we have always seen that having a mixed age group works very well as young kids love to watch the older kids and learn from them and older kids like to have fun with younger kids. What kind of music and instruments are the kids exposed to in this programme? Our music selection is based on folk tunes from around the world. It not only provides kids a wide variety of music, but also wide range of styles. We introduce kids to mostly percussion-based instruments, high in sound quality and friendly for small hands to handle. What would you advise the parents to do at home for establishing a relationship with music? The name of our program says it all. Bond over music. Listen to music as family. Sing and play along…at home, in the car, anywhere you can play music and have space to move around. What do you feel about how music is taught in schools in early years? I conduct workshops for teachers on voice modulation and how to handle music in class. 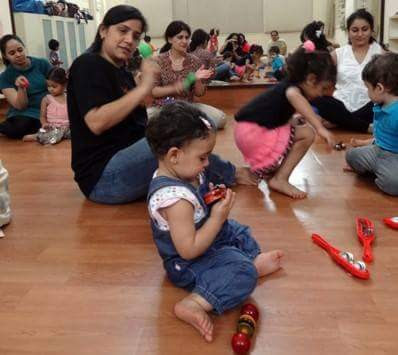 What I see these days is that more and more preschool teachers are realising that music can work as an excellent teaching tool not only to teach language and music but also help with emotional development and expression, physical movement and coordination, and enhance overall teacher student bond. The big challenge that schools and teachers face is getting the right curriculum. Based on our experience, we now also provide music curriculum and teacher training to schools. You are now at many locations, how do you maintain quality? Most of our team members have been parents in our class and often when their children have outgrown the class, moms still want to continue and join the team. We look for team members who are passionate about working with kids and bring the right attitude. Our entire team goes through training every week which helps us to maintain consistency and quality. Thank you Aditi for answering my questions and for bringing musical bonding to us. If you have kids under 5, do bond over music with musical bonding and thank me later!!! P.S. This post is a part of my series on music for kids and it is not a sponsored post. I like the mention of teaching via music. Can you suggest how to integrate music in the lives of my kids keeping in mind that I can only spell music! Any advice would be helpful. Hi Manveen, glad you found it useful. One doesn't need to know music to appreciate or enjoy it. My 18 mo learned so much through these music classes and variety of instruments. How old are your kids? May be i will be able to suggest better if i know their age. I wish they were having something like this in Vizag :( I have already enrolled my elder child for music classes at school ..
That sounds like a lot of fun. And it's important too. I constantly play Indian and Western classical at home, and for nursery rhymes, I prefer Patty Shukla who utilizes a good mix of eastern and western instruments. Ibwill cjeck patty shukla.. thanks for sharing. Ophira i am sure MB conducts classes in your locality too... do check their website. This is a very interesting and unique concept. My kids enjoy music a lot. A class like this will surely prove to be beneficial for them in multiple ways. Wonderful concept, sure to work.I have not seen a baby yet whose feet don't start tapping on music gradually.So that has for sure to be the numero uno choice for teaching and helping kids discover the world! This is a new and interesting idea! Bonding with music is so true. Wow, this is something I am hearing for the first time, I have heard about music classes for kids to learn music but this concept is altogether fun and innovative. I really wish they open their center in Delhi/NCR too, would love to join their program. Thanks Rashmi for sharing about Muscial Bonding! Thank you Neha.. i am sure they have plans of starting classes in Delhi. Music and dance are the great ways to teach kids. this music program sounds great. Thanks for sharing. Thank you for sharing about this. It's a novel concept and needs to be encouraged more. This is beautiful! More than anything, me and my husband are a bit shy when it comes to singing, but the importance it does in a child's development is making us get over our Own shortcoming :) This is a lovely endeavour! I completely agree! I started listening to music when I was still pregnant. I had read that a baby recognises sounds heard when they were inside the womb and these familiar sounds help calm a baby down once they're born. So I got a little sneaky and used to listen to all my favourite songs on repeat :P And now my baby loves most of them. Off to check out Musical Bonding. Sounds super interesting! Thanks for sharing. Wow, amazing concept. I usually sing to my baby, even while i was expecting. And the same songs seem to calm him down now. Daddy loves country music so we listen to a lot of those mellow tunes at home! Love your program.